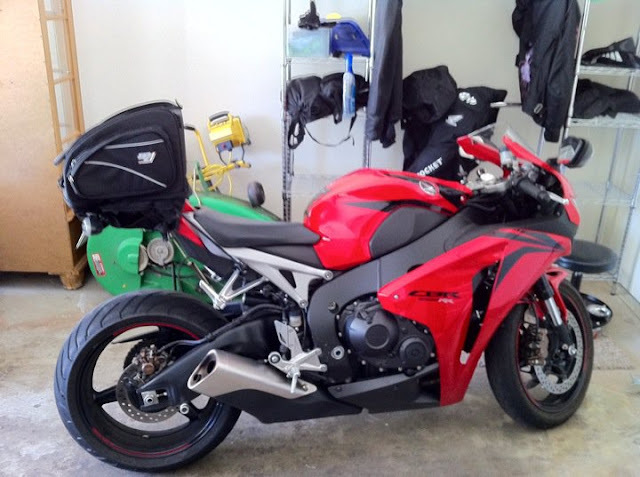 In 2010, I sold my 2005 VTX1800N and switched over to the sport bike scene with a 2009 CBR1000RR. I have grown fond of taking extended motorcycle trips on cruisers over the years. One thing that is extremely easy to do on a cruiser is get storage setup. I made use of a nice, large rear seat bag that strapped to my sissy bar. I could pack nearly my entire wardrobe in that sucker. I was cruising around online looking for some storage solutions for the CBR. I want to have the freedom of space, look okay, and not restrict my movement. I began researching the company Nelson Rigg and was able to pickup a CL-100 tail bag from Motorcyclegear.com. I do not have detailed pictures that I have taken, but if you go to their website and click the picture they have a bunch. When the package came in, I opened up and began to quickly think, "how the hell am I going to fit this on my bike?" It's a big bag. When the description talks about holding 29.83 they are not lying. I quickly figured out that the bag has zippers around the base and sides to extend it out another 2" up and out. When you fold open the main compartment you have a nice net design and cell phone pouch on the top and a massive location to store gear/clothing/etc... Both sides contain a zip open pouches. Perfect for any items you want to have quick access to. I have thrown in my IPass (EZPass), cell phones, wallets, etc... There is quite a bit of room in them. The unit comes with a pretty solid mounting setup. You have flaps or wings on the base that fold over each side of the rear seat (helps protecting the seat cushion and plastic). From there you have a main buckle that connects under the seat and then two sets of bungee hooks that come out to balance the pack out on the back. You never want to mount a bag, especially on the tail, to only it's self. Always connect straps to the bike itself so that the big does not twist to the underside and get stuck in the wheel. Basically, I snap the buckle below the seat, hook the rear set of bungees around my plate and the front set to my passenger pegs. The bag is very sturdy and has survived a full day of riding with no movement as well as many partial days for running errands. Another nice feature is that the bag is made to work with the Nelson Rigg saddlebags. I have not needed any for trips but it is nice to have the ability to add these units onto the bag. Additionally, you get a shoulder strap (but it does have a built in handle for carrying) and a nice rain pouch and goes onto the bag. I am very happy with the bag. It is truly made for trips but can work for errands around town. It fits on the 2008+ but does look a bit big. It also fits on the 2007 and less (with underside exhaust). You can either remove the rear seat and buckle to it OR just use the bungee cords to mounting points on the bike. I would highly recommend it due to the quality, amount of space to amount of money invested, and functionality! Last edited by dray0n; 04-05-2011 at 06:22 PM.